Reliable hand protection is important with all tasks that include any kind of physical hazards. 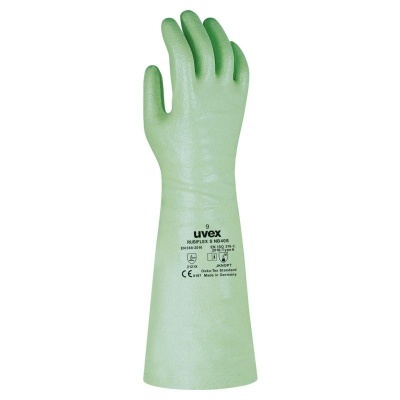 The Uvex Rubiflex S NB40S 40cm Reinforced Chemical-Resistant Gloves offer good resistance from both chemical and mechanical hazards, while ensuring your hands and forearms remain dexterous and comfortable throughout use. The Rubiflex S NB40S Gloves are suitable for contact with food, including aqueous, acidic, alcoholic, dry and fatty foodstuffs. This makes them ideal for tasks such as food manufacture, ensuring all hygiene protocols are met. The Uvex Rubiflex S NB40S 40cm Reinforced Chemical-Resistant Gloves are available in three sizes. Please measure the circumference of your hand around the knuckles (excluding the thumb) with your hand open and your fingers together, and the length of your hand from the tip of your middle finger to your wrist.